Heat the barbecue to a medium heat and place the lamb in the centre, place the potatoes skin side down around the edge of the bbq and close the lid. After the 30 minutes turn your lamb and cook for another 30 minutes. If the lamb needs more cooking just leave for another 20 minutes. After this remove the lamb and the potatoes and turn the barbecue up. Remove the skin form the potatoes and chop then mix with the sour cream. Roll the flat bread out and cook on the barbecue for 1 minutes, once you have nice colour carefully turn your flat bread and cook the other side, brushing honey on the cooked side. 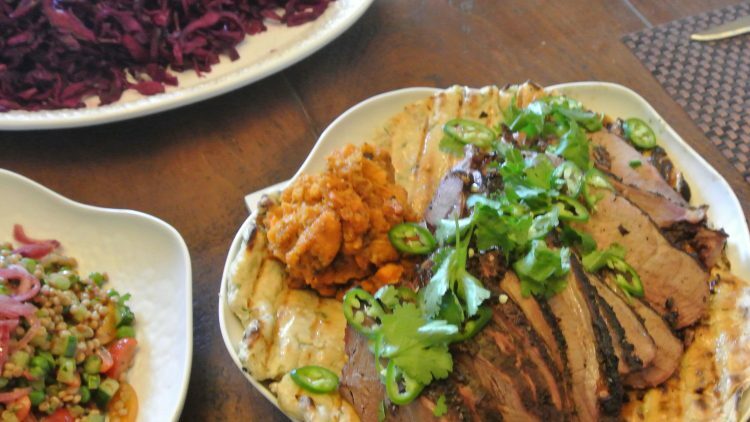 To serve place the flat bread onto a plate and top with the sweet potato and sliced lamb, the bread will absorb all the cooking juices from the lamb.